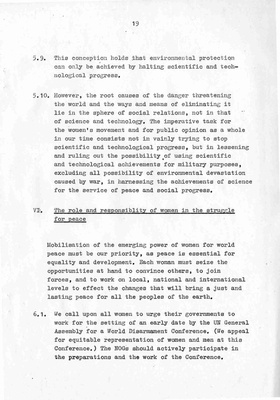 "International Women's Year, Berlin Paper, page 19"
From the papers of Dr. Usha G. Mahajani, this is page nineteen of a working paper from Commission VI of the International Women's Year World Congress in Berlin, October 1975. The page discusses women's role in the protection of the environment and worldwide peace. The environment and peace are foci of the Commission along with detente and international security. Mahajani, a Political Science professor at Central Washington State College [CWU] from 1967-1978, attended the IWY Congress as a delegate for India. "International Women's Year, Berlin Paper, page 19" (1975). Washington State Conference for Women, 1977. 264.